In case you haven’t heard, LinkedIn is rolling out a new search interface globally over the next few weeks. If you’d like to read the official statements and press-friendly content about LinkedIn’s new search functionality, you can find read about the changes on LinkedIn’s blog, TechCrunch, Search Engine Land, Mashable, and PCMag.com. If you’re only going to read one – read TechCrunch’s – it’s the best of the bunch in my opinion. However, if you’d like to know what a LinkedIn power user and sourcing/information retrieval geek thinks about LinkedIn’s new search functionality, you’ve come to the right place. I’ve had access to LinkedIn’s new search interface and functionality for a week now, and I wanted to share with you my first impressions, discoveries, disappointments, concerns, and suggestions for LinkedIn. LinkedIn Search: New, but Improved? Of course, I’ve only had access to LinkedIn’s new search for about a week now, so I can’t tell how “smart” is has become based on the queries I’ve been feeding it. However, the issue I have with any query intent algorithm that claims to be able to provide me with more relevant results is that only the user can determine if results are “relevant” or not. As such, by definition, only the user can truly determine or judge relevance. A search engine cannot ever truly “know” the needs of the user. While I appreciate and applaud the intent behind an “intelligent query algorithm,” which isn’t dissimilar to what many have been trying to do for years when it comes to search, the best way to implement such a system is to incorporate a feedback loop for the user to tell the algorithm which results the user truly finds relevant, rather than relying on supervised or unsupervised machine learning or some other method based on which profiles are clicked vs. which ones are not, and/or perhaps time spent reviewing specific profiles. I’d love to know exactly how LinkedIn’s smarter query intent algorithm works (I’d love to make it smarter! ), but something tells me that’s not something they would disclose. I’m not a fan of black box search algorithms – I like to know exactly why I get the results I do. I was also excited when I read about suggested searches, because my mind immediately raced to thoughts of LinkedIn being able to suggest better queries or perhaps searches other people had run for similar terms/people. 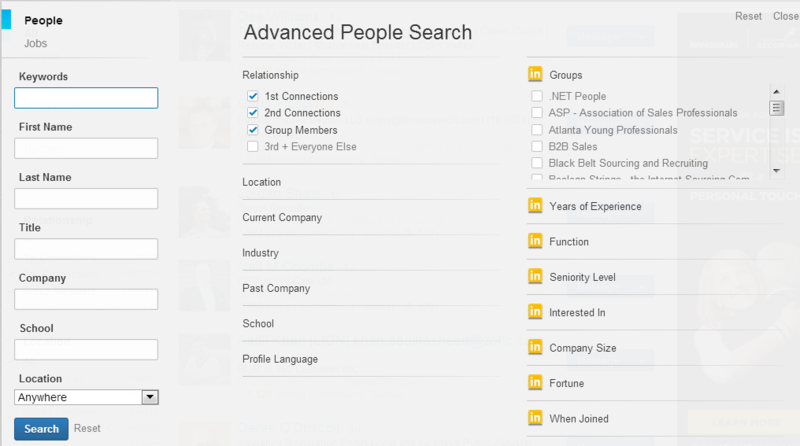 However, what LinkedIn is really referring to with regard to “suggested searches” is related to new unified search functionality in that if you type in a term or a title into the main search box on LinkedIn, you will see a list of options you can choose from, such as searching for related jobs, people, connections, groups, and skills. This makes total sense based on the LinkedIn’s underlying fundamental concepts, but from a recruiting perspective – what if the best candidates aren’t within the network of the person conducting the search? While Stephanie Mlot from PCMag claims LinkedIn’s changes put “…LinkedIn on a more level playing field with Facebook, which introduced Graph Search earlier this year as a way for users to sift through the network’s 1 trillion connections for more details about their friends,” I don’t agree. One major distinction is that a user can search for and find anyone using Graph Search – regardless of whether or not they are connected to them in any way. Of course, LinkedIn does offer a solution for people who want the ability to search for anyone regardless of network connection – it’s called LinkedIn Recruiter. However, if you’re searching LinkedIn for free, you’ll notice you no longer have the ability to sort all of the results of a search, which leads me to what’s missing from LinkedIn’s new search interface and functionality. While LinkedIn Signal isn’t new – what IS new is that you no longer have to go to “News” on the top nav bar and click “Signal” – you can now simply click “Updates” on LinkedIn’s new search interface to instantly be taken to a Signal search for the keywords you’ve already entered. 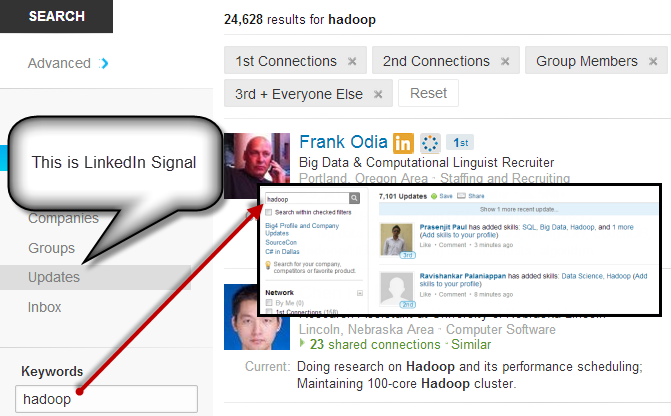 Signal is one of LinkedIn’s most powerful and underutilized features. With the new and more prominent placement, I hope Signal will get the use and appreciation that it deserves. 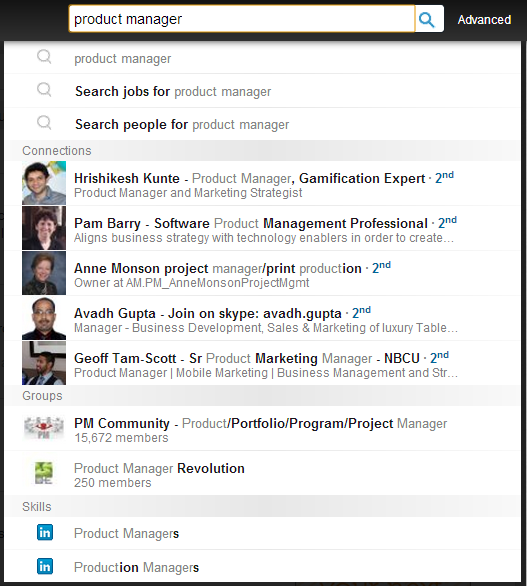 Curious to know what’s NOT included in LinkedIn’s new search interface and functionality? First and foremost, you can no longer sort your search results. I always searched by keyword relevance when searching LinkedIn, because even with a large network, I am not so ignorant as to believe that the best people for any given position I may be sourcing and recruiting for are always going to be within my 1st or 2nd degree network, let alone my 3rd degree connections or within my LinkedIn network at all. If the best match to a search happens to be in my 3rd degree network, I’d like to see them come up on page 1 of the results. 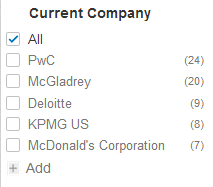 LinkedIn’s sort by “relevance” option was a mix of network connection and keyword relevance. 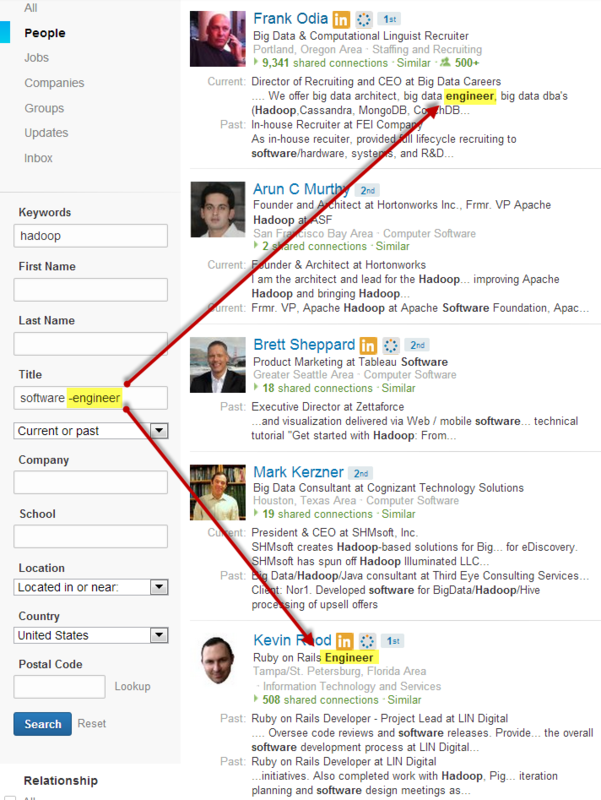 Based on my searches using LinkedIn’s new search interface, it seems that search results are sorted based on some combination of keyword relevance and relationship, as 1st and 2nd degree connections are returned early in search results and 3rd degree and group only search results come much later in ranking. While you can still search specific layers of your LinkedIn network, there is no way to search for Group-only connections that are not also connected to you in the 1st, 2nd, or 3rd degree. With a free account, the only way you can try and achieve anything close to searching solely by keyword relevance is an X-Ray search. 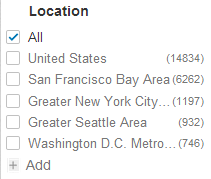 Thankfully, you can still sort your results by keyword relevance within LinkedIn Recruiter. I am sad to report that LinkedIn’s once-epic ability to run Boolean search strings of over 3,000 characters has come to an end. That means you can no longer perform some of the interesting diversity sourcing searches I’ve detailed in the past, such as searching for all of the HBCU’s in a single search, or searching for the 354 most common female names in the U.S. over the past 4 decades to find 65% of all of the women on LinkedIn in a single search. From my preliminary testing, it seems that you can get away with searches up to around 1,300 characters with spaces before you start to encounter LinkedIn just spinning and never executing your search. With a first name search, this is what 1,281 characters with spaces looks like. 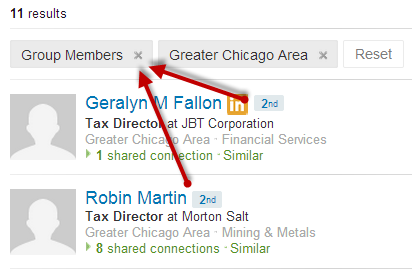 Also missing from the LinkedIn’s new search interface is the ability to see the top 10 results in each facet. I can’t be the only person who found the ability to see the top 10 companies employing certain types of people in a given market, the top 10 markets for specific skills, or the top universities by skill to be valuable, can I? Now free users are limited to the top 5. Thankfully, you can still view the top 10 results in each facet in LinkedIn Recruiter. Alas, Voltron has laid LinkedIn’s Advanced Search Operators to rest. What? 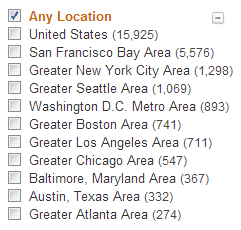 You didn’t know LinkedIn had Advanced Search Operators? They may have been LinkedIn’s best kept secret for years, and you could do a number of interesting things with them, such as creating search agents. Are you wondering why I referenced Voltron? 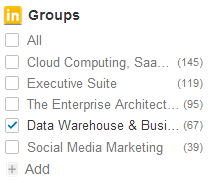 I’m assuming Voltron is the code name for LinkedIn’s new search and that “vsearch” also stands for Voltron Search. Anyone care to (neither) confirm (n)or deny? Ingrid Lunden from TechCrunch called out the fact that mobile is missing from this LinkedIn search upgrade. LinkedIn has claimed that extending new search functionality to their mobile apps is something that they’re looking into, but for now, the mobile apps only allow users to search people but not within other categories. Mobile search is a big deal for LinkedIn – did you now that 19 people searches are performed and 41 profiles are viewed every second via LinkedIn mobile apps? What About 3rd Degree Connections? 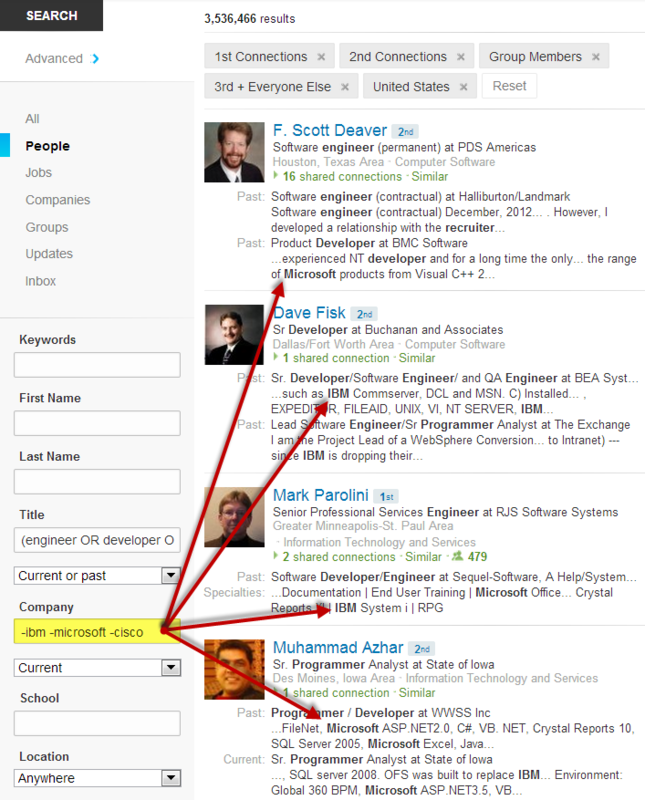 While there was a bit of early buzz that users searching LinkedIn with a free account would not be able to search 3rd degree connections, you can in fact still search for them. Thankfully, I haven’t run across too many search anomalies yet, but I did find a few I think you (and the LinkedIn dev team) will find interesting. I then set about to see if I could use the -/NOT functionality to eliminate results from the top 5 companies in order to find the next top 5 (thus completing the top 10). 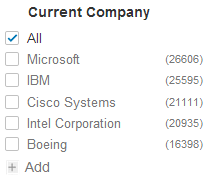 I started entering 1 company at a time in the current company field: -Microsoft, -IBM, -Cisco, etc. 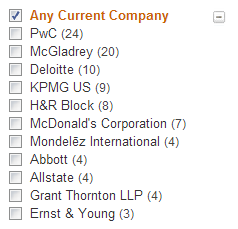 This seemed to work quite well in removing those companies from the top 5, allowing me to explore the next 5 or more. But then I noticed that when I was excluding the company names in the current company field, the company names were being returned as positive hits and highlighted as keywords in the profiles. The same thing happens if I change it to -(ibm OR microsoft OR cisco). The same thing happens when I try to exclude a term from the title field. As you can see below, I am excluding the term “engineer” from the title field, and while the term is excluded properly in most cases, there are a few random results where “engineer” is in the current title – as with Kevin below, the word “engineer” also shows up as a positive & highlighted keyword hit in summaries, headline phrases, etc. It doesn’t matter if I use NOT, AND NOT either – I’ve tried all 3 ways and get the same results. 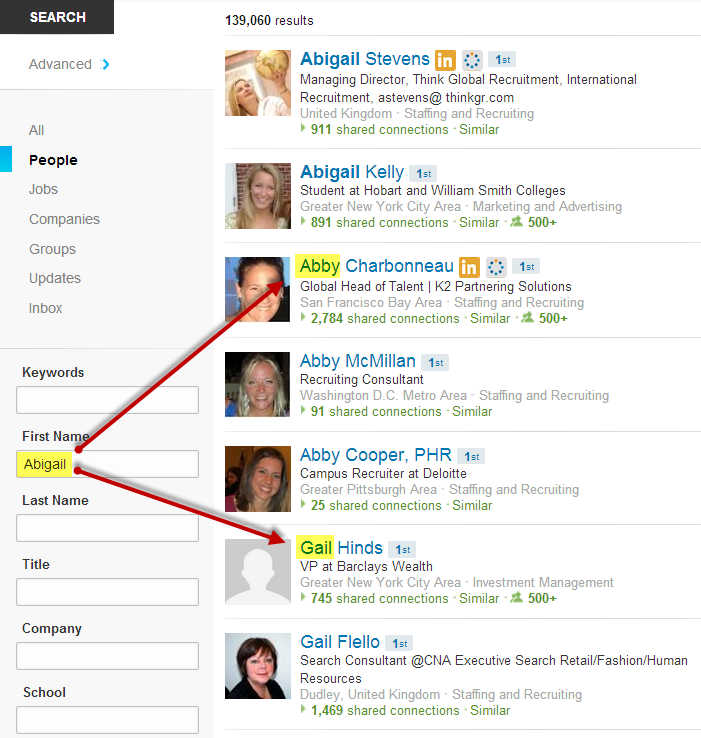 This one is pretty strange – I ran a first name search for “Abigail” and got results with “Gail” and “Abby” on the first page. I don’t know how much of a fluke this is, because I’ve tried other names as well as searched for companies and various I.T. keywords to see if LinkedIn is performing some kind of fuzzy matching but have yet to run into another instance where LinkedIn gives me terms other than the one I specifically searched for. Please let me know if you find any. Also, it seems that the ability to search within groups from the main search interface is still being listed as a premium filter with the yellow “in” icon, yet I can search within groups with my free account. Maybe it’s actually free functionality now? For quite some time I’ve been thinking about writing a post specifically about what I’d like to see from LinkedIn with regard to new search functionality, but I’ve never gotten around to it. Stemming/root word/wildcard search. It would certainly be nice to not always have to construct massive OR statements, e.g., (develop OR developing OR develops OR development OR developed OR developer). Not only bring back the top 10 in each facet – but enable them to be expanded to the top 25. Expanded facets yield incredible market and competitive intel/insight with the click of a mouse. Ability to sort by keyword relevance not tied to relationship. If you can’t/won’t bring this back to LinkedIn for free accounts, at the very least, never get rid of the ability to sort by keyword only relevance in premium versions. Keyword boosting – enabling users with the ability to determine which keywords are the most relevant to them. Proximity search – enabling users to search for terms within a specific distance of each other, to achieve semantic search. If you weren’t already aware, LinkedIn used Lucene for text retrieval, and Lucene is capable of wildcard search, variable term boosting, and variable proximity matching. I wrote a post nearly 4 years ago titled LinkedIn Search: What it COULD and SHOULD Be – I suggest you take a look and also read the comments, because one of LinkedIn’s principle software engineers working on LinkedIn’s search engine at the time weighed in with some very insightful comments here and here. What would YOU like to see added to LinkedIn’s search functionality?